Portobello Road Gin has created the first London Dry Gin made with British asparagus. The limited edition ‘Directors’ Cut’ distillation contains a unique blend of botanicals including asparagus from Cambridgeshire, harvested by director Paul Lane this June. Distilled by master blender Jake Burger, other botanicals include Gentian root, juniper berries, cassia bark, nutmeg, lemon and orange peel. The concept of the Directors’ Cut edition was conceived by the four directors of Portobello Road Gin – Ged Feltham, Paul Lane, Jake Burger and Tom Coates – who wanted to satisfy their desire to produce a very special gin, for which they could hand-source the botanicals themselves. Crafted in still Copernicus the Second then, bottled and labelled by hand at the second smallest museum, the Ginstitute, on Portobello Road, 1,000 bottles of this distinctively nutty-flavoured spirit will be available from this October. 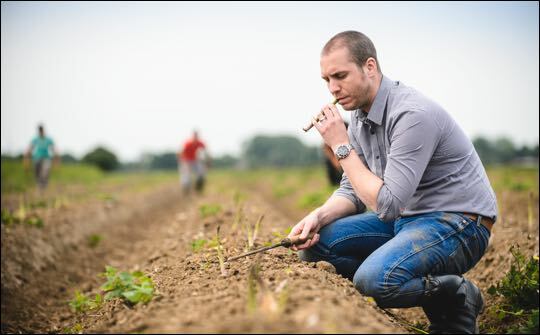 Paul worked with Cambridgeshire asparagus producer Will Aveling to source 10kg of spears during the last days of the asparagus season this June, tasting and selecting the thinnest spears due to their high concentration of flavour. Jake Burger distilled the blend of botanicals to create the classic juniper-forward character of Portobello Road Gin but with an unusual hint of asparagus on the nose and that distinct sweet flavour continuing through onto the palate. The sweetness is counteracted by the dry, bitter character of the small amount of Gentian root, which also has a slight mineral flavour (reminiscent of wet slate) with the typical spicy, long finish of Portobello Road and a punchy 47% ABV. Paul Lane comments: “We take immense pride in our craft when producing Portobello Road Gin, distilling with integrity and individuality. But with the Directors’ Cut we’re able to take our passion for experimentation to a whole new level. Portobello Road Gin The Directors’ Cut will be available from October 21 at www.portobelloroadgin.com and selected independent retailers, priced at £39. Portobello Road Gin is available in store and online from Waitrose, Selfridges, Tesco and Harvey Nichols. RRP £25. Nestled away on the top two floors of a 19th century public house on London’s world famous Portobello Road is The Ginstitute: London’s second smallest museum and home to a 30L alembic still, Copernicus the Second. It was here, while putting together The Ginstitute that Ged Feltham, Jake Burger and Paul Lane decided the experience wouldn’t be complete without a gin which could call The Ginstitute home. In the nine months of experimentation that followed, the character of the gin was slowly created and Portobello Road No 171 Gin was born.